Specializing in authentic Karoo cuisine, the Buffelsdrift Restaurant offers guests a delicious a la carte menu of homemade foods and local fresh produce. As accompaniment, our wine selection consists of some of the best award-winning wines on Route 62, South Africa’s longest wine route. 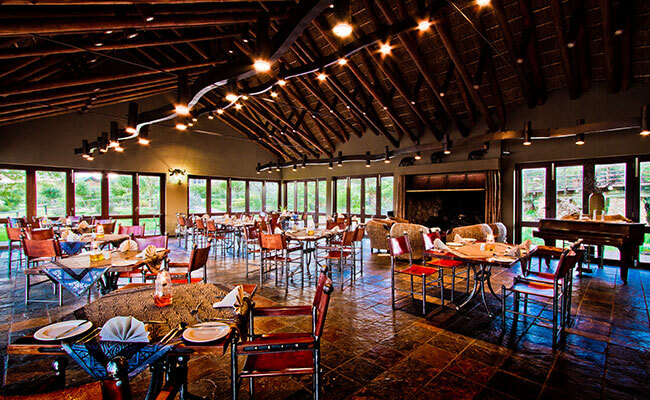 Our restaurant also expands to the wooden deck, overlooking our 5ha waterhole filled with big fish, turtles and hippo. If you are lucky, you might even spot the elephants and other game on the opposite bank. Breakfast consists of hot and cold dishes. It is a buffet style breakfast so you are spoilt for choice! Our a la carte menu is filled with speciality dishes, all authentic to the Karoo. There are many options available for both meat lovers and vegetarians. Our A La Carte Restaurant was awarded the Diamond Diners Club Winelist Award and the Best New Winelist Entry 2012. Brilliant Local Wines to choose from.. The Klein Karoo wine region in the Southern Cape is arguably the most diverse of South Africa’s wine regions, stretching along the Cape Route 62 from Montagu in the west to the Outeniquas in the east. The Klein Karoo is situated between spectacular mountain ranges, and its vines are mostly grown in the fertile alluvial soil along the riverbanks. The climate is generally drier than that of the other wine regions, resulting in healthy vineyards, which are grown organically to a large extent. Various microclimates enable Klein Karoo winemakers to produce different styles of quality wines – including dry wines, fortified wines and potstill brandies. Muscadel, Cape Port, witblits, intriguing red blends and a selection of white wines make for a delightful discovery.